used in cable pulling operation. 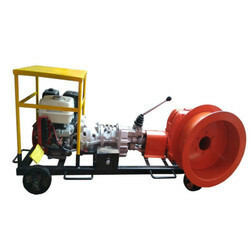 We are a top-notch organization, engaged in providing Diesel Cable Pulling Winch. A range of Trailer mounted Cable Pulling Winches required for the installation of Power Cables where high pulling tensions are required. Our firm has been offering to its customers only high quality products and in this range we are offering Cable Pulling Winch with a pulling force of 10000 kgs. This winch is a heavy Cable Pulling Winch & extensively used for pulling 110KV, 220KV & 400KV EHV Cables, it is also used for various other industrial purposes. We are attractively offering a wide array of Cable Winches to our clients that are durable in nature and are flawless in performance. These offered products are manufactured by using supreme grade raw materials. Our prestigious clients can avail these products at leading market price from us. We bring forth vast industrial experience and expertise in this business, involved in offering high quality range of Cable Winch. wea are offering to its customers only high quality products and in this range we are offering Cable Pulling Winch Machine . 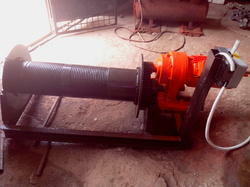 This winch is extensively used in various industrial purposes. Customers are availed this range in the most comprehensive prices.